JAL TO KONA: Rep. Mark Nakashima, Rep. Nicole Lowen, Gov. 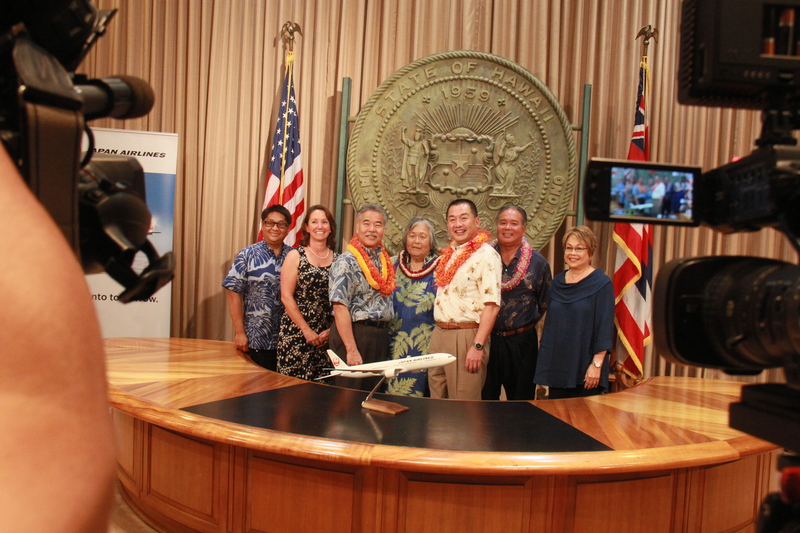 Ige, Haunani Apoliona, JAL board chair Masaru Onishi, Wil Okabe (for Mayor Harry Kim) and Sen. Lorraine Inouye. Governor Ige, Japan Airlines and the state Department of Transportation have announced JAL’s return to Kona International Airport on Hawai‘i Island. The new service is in addition to JAL’s current flights between Tokyo, Osaka, Nagoya and Honolulu. The new daily flights are set to begin on Sept. 15, 2017.